I’m here working with the Kiva field partner Tujijenge. Last week, I double-checked that I had all of my notes, pens and everything else I needed for the day, and I went out into the field for my second borrower verification. I set off with Maria, the wonderful Kiva Coordinator at Tujijenge, to board a sweltering bus towards Lumumba in the early afternoon. The colorful Makumbusho bus station is just a short walk from the Tujijenge office. Buses here aren’t on a schedule, so you show up at the bus stop and your bus will leave once it’s full. Luckily the station is always packed, so our bus left after about 3 minutes of waiting. The buses are so hot that you start sweating pretty much as soon as you step inside. I’ve paid a lot of money to sit in a sauna at a spa in San Francisco, so I try to think of these bus experiences as just a significantly cheaper sauna (because that’s truly how much you sweat). This bus ride was one of my favorites I’ve taken because a group of about 8 little school kids got on board and as luck would have it, the only open seats were next to me. They were definitely surprised to see an American on the bus, and they kept staring at me. I smiled and said basic Swahili greetings and they would giggle and get shy and turn their heads, only to look back at me a few seconds later. One of the little boys loudly said, “Hi,” and I could tell he was very proud that he knew that English greeting. Maria and I got off in the Kilimani neighborhood and hopped into a bajaj (a little tuktuk) to take us down the bumpy dirt road to Samweli’s shop. 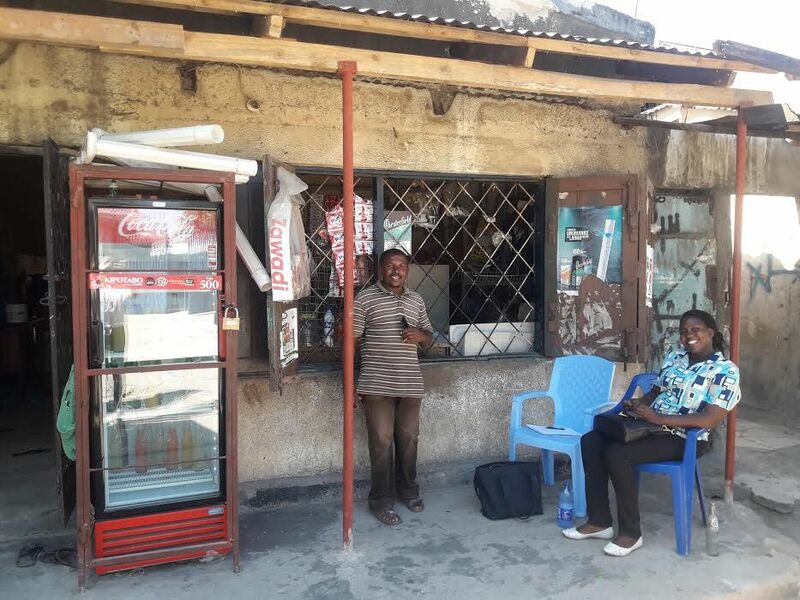 Samweli and his friend Mapinduzi (a fellow Wazalendo Group member) were both waiting at the duka (shop). It was a blazing hot day so before we did anything else, I bought cold water and Fantas for me, Maria and Mapinduzi. 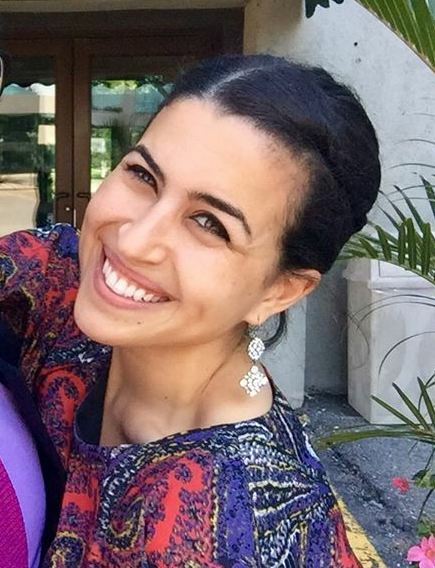 Maria and I sat down to ask Samweli questions about his experience with his Kiva loan. 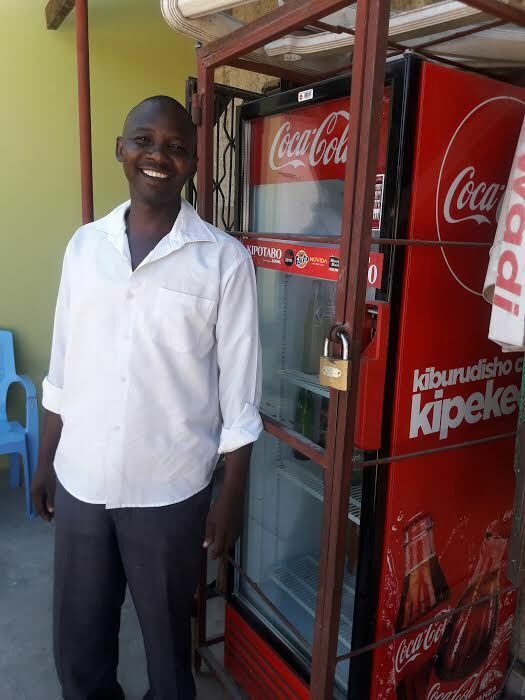 He took out a loan in December and used it to buy new goods for his shop. He was even able to buy a refrigerator that certainly helped me out on what was a brutally hot day. He took the profits he made from his first shop and opened up a second shop about a 20-minute walk away. His first shop is named after his wife. Samweli also has 2 young kids, a 9-year-old and a 12-year-old. 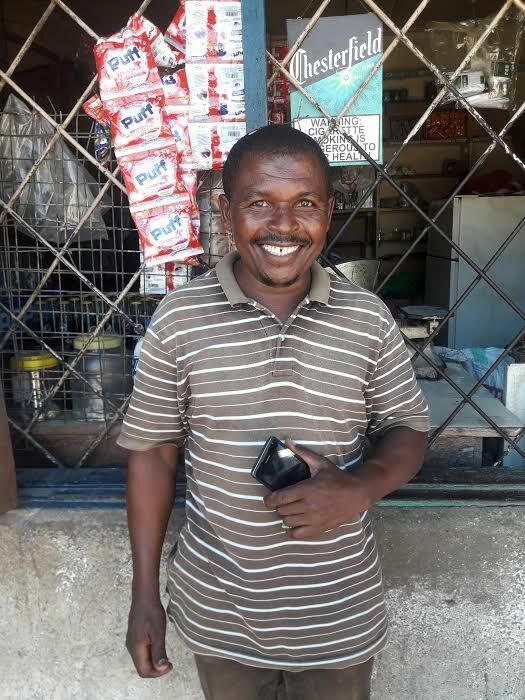 He was very proud that he invested his profits back into his business and was already able to open up a second shop in January, 2018. He wants to continue to invest his profits back into his business so he can keep growing and expanding. We had a great chat with the two of them (thanks to the translating help of Maria). Samweli and Mapinduzi laughed when I said “tabasam” (smile) when I took their photos. Maria told me that ‘Mapinduzi’ is also the Swahili word for revolution. I told him that was a very cool name, and he smiled and agreed. When I asked to take their photo, Samweli quickly went to the back of his shop and returned with a freshly washed and pressed white button down dress shirt. It was about 100 degrees and humid, so putting on an extra long sleeved layer certainly wasn’t for comfort. He takes so much pride in his business and his relationship with Tujijenge and Kiva, and wanted to look professional for the photo. We set off to walk to Samweli’s second shop, and stopped at Mapinduzi’s cafe on the way. He named it Garden Cafe because there is a large patio area where people can enjoy their lunch. He sells chips, chicken, eggs and other food items. I wanted to support his business and also really needed eggs to bake with when I got home that evening, so I purchased 10 eggs. As soon as I saw him carefully wrap them up in a plastic bag, I wondered how I would carry a bag of eggs with me for the rest of the day and immediately questioned my purchase. I can proudly report that 9 of the eggs made it into my refrigerator at home safely. Kilimani has a real neighborhood feel. Everyone seems to know each other and there were heaps of kids running around outside after school got out. Samweli and Mapinduzi knew literally everyone we passed. As we walked down the street, everyone greeted them, they asked neighbors questions and overall seemed like celebrities. I joked that Mapinduzi was famous in Kilimani, a joke that he seemed to really appreciate. He laughed and said that he just really likes to talk. We called him the Mayor of Dar es Salaam, another joke which elicited a laugh. We passed a large church complex on our left, and Samweli explained that this is the church they both attend. There was a Canadian pastor who worked there for a while to set up some programs and a school. Samweli taught a driving class and also a carpentry class there. We later found out he also runs a carpentry business, and I wonder what can’t this man do? The dusty roads ended and we reached the busy main road. Mapinduzi asked if I could run across, so I explained that I love to run but haven’t run in Dar since it’s too hot for me. We wait for a break in traffic before jogging across, then continue our walk to Samweli’s second duka. After our visit, I thanked them for speaking with me and they say (in Swahili) that they enjoyed speaking with me too. They walked Maria and me to the bus stop and we jumped on the bus to Lumumba to visit the Tujijenge branch there. On the bus Maria and I spoke about how impressed by the two of them we were. 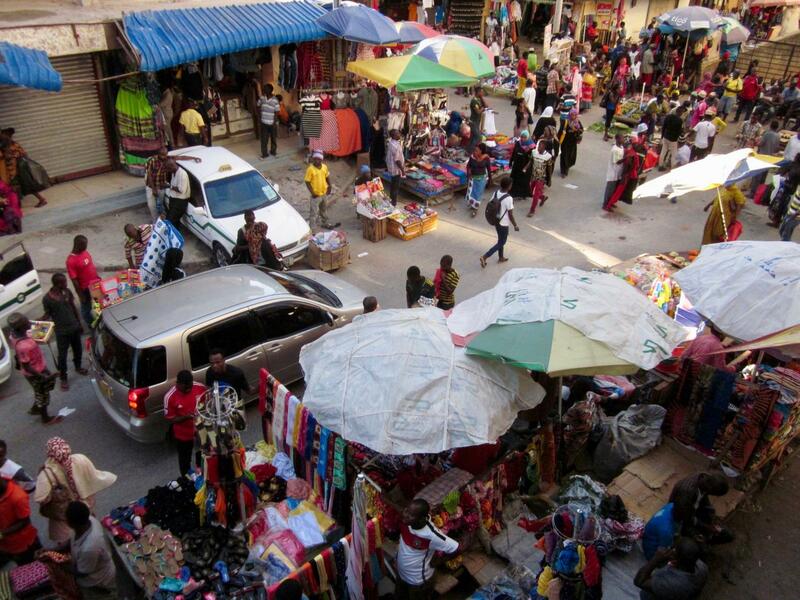 I noted that I was blown away by the amount of business owners, street cart sellers and other entrepreneurs I’ve seen in Dar. It seems like everyone is hustling to sell foods, household goods or brightly colored dellahs (traditional dresses). Maria told me that people here are really struggling economically, and it’s so hard to find a job that many people start their own businesses to make money. She said that Tanzanians are extremely hardworking. We continued on the bus to Tujijenge’s Lumumba branch to look at some of the loan paperwork for Samweli and his borrower group Wazelendo. The Lumumba area is crazy, it’s packed with people (especially because we arrived right as everyone was leaving work). We visited the branch and stopped by the Kiriakoo market before heading home. There are more people in that market area than nearly anywhere else I’ve seen (think the grocery store on the night before Thanksgiving). I wandered through the market trying to take in all of the sights while comically trying to protect my bag of eggs from smashing into anything. Who brings a bag of eggs to what I can imagine is one of the most crowded areas in the country? Meeting with Samweli and Mapinduzi felt like a big win early on in my fellowship. 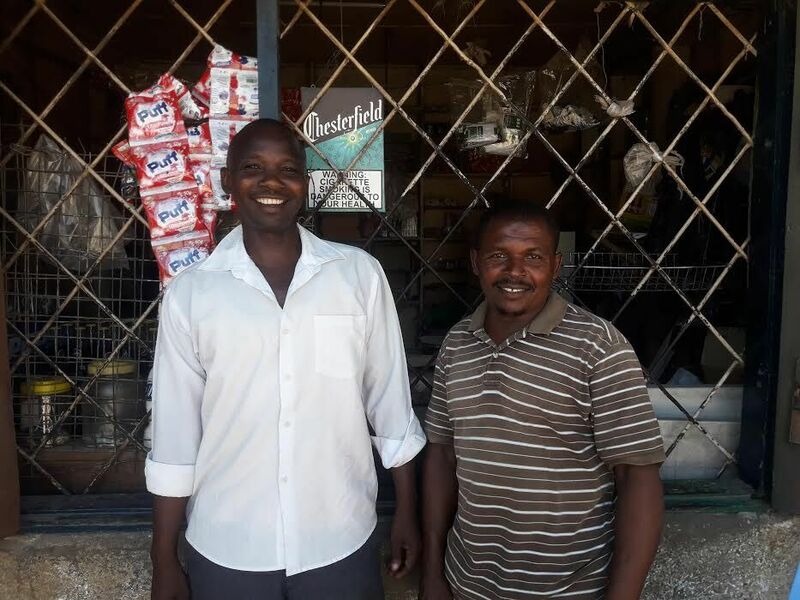 I loved hearing about their business successes and how Samweli's Kiva loan has impacted his life. 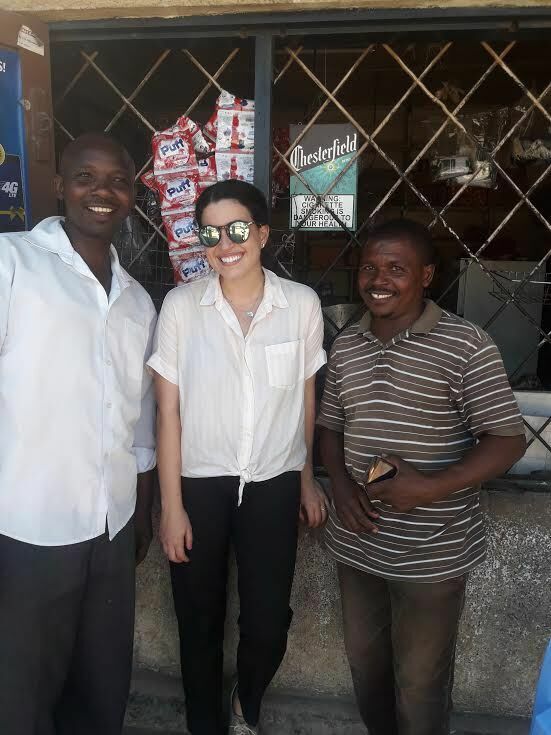 Getting a chance to personally meet with Tanzanian entrepreneurs felt like a behind-the-scenes peak at the hustle I see from people here everyday. 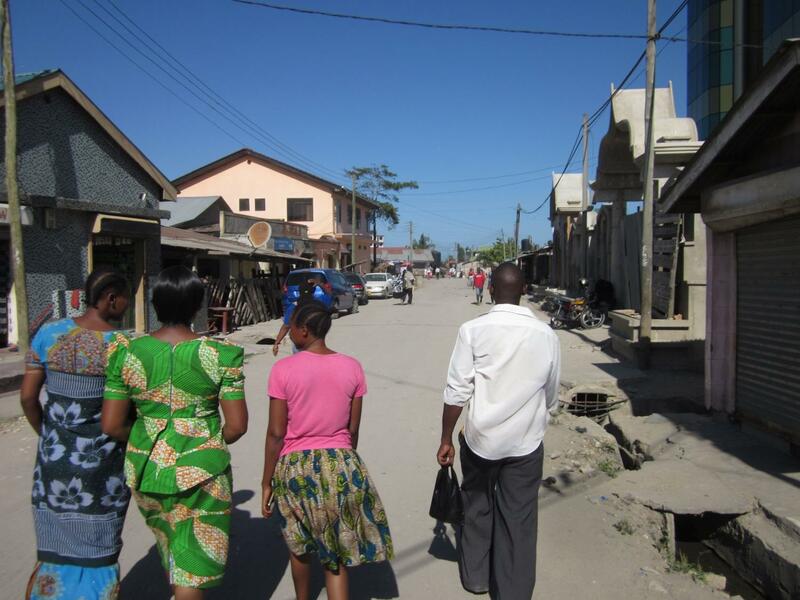 If you’d like to help support other Tanzanian entrepreneurs, you can do so here.